Spring has sprung! 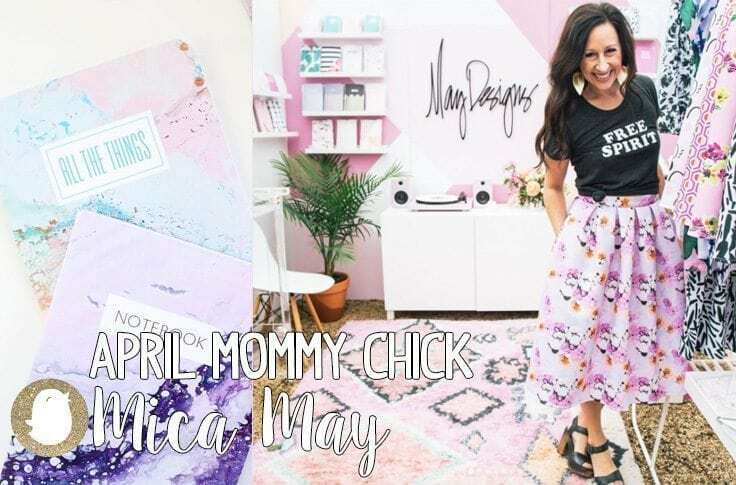 And I couldn’t think of a better fit for this happy season other than featuring the incredibly talented, Mica May–CEO & Founder of May Designs–as our April Mommy Chick of the Month. If you aren’t familiar with May Designs, it is a lifestyle brand specializing in customized notebooks, stationery, and more! Mica’s company has been featured on Good Morning America, The Today Show, Real Simple and was named one of Oprah’s Favorite Things! She is the real deal and a true inspiration to women, mothers, and mompreneurs everywhere! We are honored to share our interview with Mica today and hope you all enjoy getting a peek inside her life and receiving some wonderful words of wisdom. Please welcome our April Mommy Chick, Mica! Nina: Hi, Mica! We’ve been following your May Designs journey and are so inspired by your creativity! Tell us what inspired you to start your business. Mica: Honestly, I just love writing things down. I love pen and paper and I’m a total nerd when it comes to ink and paper textures and how it all works together. I’m the girl who always wanted to have an “aqua” spiral for Science or “magenta” instead of red for Reading. When I couldn’t really find any notebooks that I absolutely loved–I started making my own. I wanted something really thin that I could throw in my purse, something sustainable that would last the wear and tear of me using it all day every day, and then something fun that had a design on it that I could love for a period of time but switch out for something new when I had used up the pages. N: We love your notebooks, too! 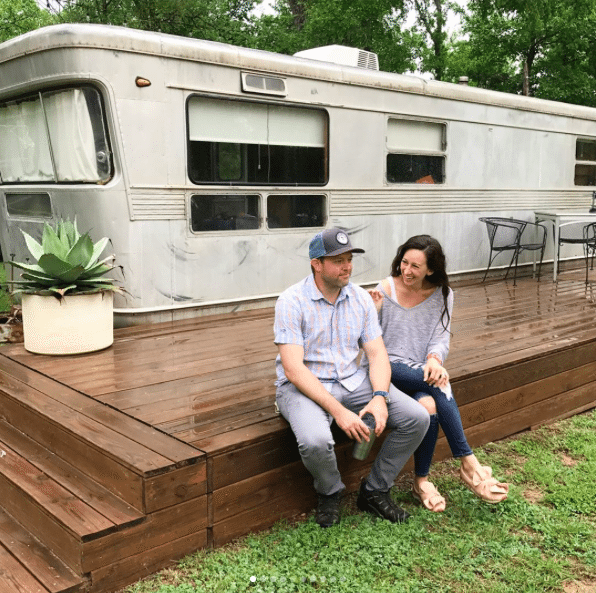 How do you balance being a full time CEO and mama of three? M: I’m not sure balance is the right word. The struggle is real and it’s always a give and take! I try and maximize my time by constantly evaluating our day to day activities–and remove as many of the the unnecessary things (like long commutes) out of our lives as much as possible. I literally made a list of all the things that happen on any given Monday (and Tuesday, and Wednesday . . . ) and then I put my name next to the things that only I could do or I was somehow emotionally connected to. For example, I love picking my girls from dance class. I love watching them dance through the little window and they are always so so excited I’m there to pick them up! I wouldn’t miss it for the world. But dropping them off isn’t as important to me . . . and since I absolutely cannot do it all, I don’t. I pick and choose the things that have the most impact (for both of us, my kids and myself!) and then I quit feeling guilty for the things I didn’t really want to do anyway! Being FREE is the best place–and when I’m in a season of feeling free–that’s when I feel like I’m in my sweet spot. N: You obviously have a lot going on! How do you stay organized? M: Truly, I am crazy about our new folios. 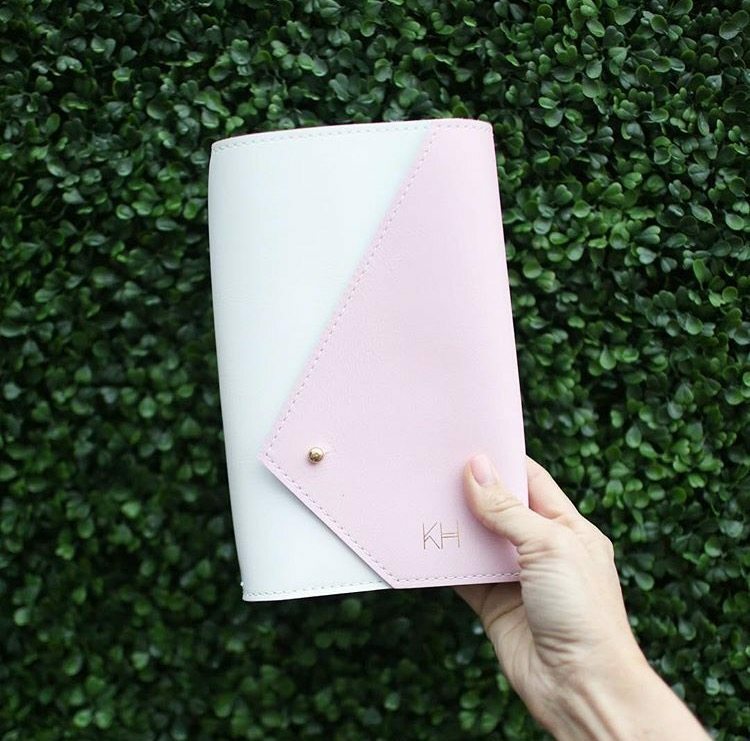 I always have several notebooks going–so it’s been a lifesaver since we’ve launched them! Here’s my favorite four: Months + Dots, which I use for all my high level planning. Vacations, kids schedules, summer camps, all that goes in the calendar part of that notebook. Then, I use dot grid for everything else! I almost always have a coloring book in my folio for my girls to draw in if we are at the doctor, restaurant or out somewhere. And then the prayer and gratitude inside pages help to set my day off right! N: Moms are short on time in the morning, do you have any quick beauty tricks to share with our Mommy Chicks? M: I’ve got my morning make up routine down to literally about 3 minutes. I brush on some mineral powder, breeze cheeks with some blush, add a little basic eyeshadow, put on some lips and I call it a day. I’m obsessed with dry shampoo because my hair actually does better if I don’t wash it every day! My last MAJOR time saving tip is that I recently got eyelash extensions, which I know is not for everyone. I got a steal of a deal at a local place in ATX and because my natural lashes are truly super short and stick straight out, it was a big part of my morning routine that left me feeling frustrated a lot of the time. I don’t have to do anything to them at all, I can’t feel them, and it’s been a game changer for my morning. N: We love the little cocktail parties y’all throw in the office! What’s been your favorite recipe thus far? 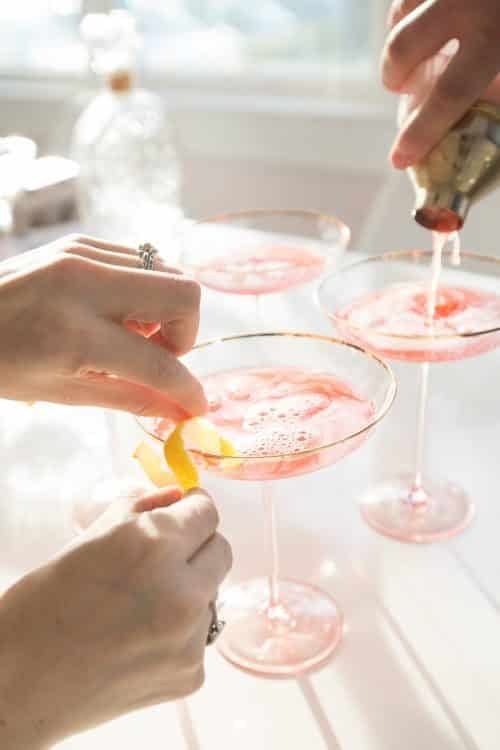 M: I’m a super seasonal drinker, so in the Spring/Summer I love light and floral cocktails, Margaritas + Rosè all day! The Hemingway Daiquiri is one of my absolute favorites, you can find the recipe here! N: How do you like to unwind after a long week? M: Get outdoors with my kids! Do something active–even if it’s just a walk to a local park or venture into the greenbelt with my family. Putting my phone away and just giving them undivided attention is the best and fills up their love tanks! M: I’m absolutely still learning, every single day! I feel like the lessons ebb and flow as the years pile on and the kids get older . . . but I think the most significant thing I’ve learned is that there is so much grace and forgiveness that comes from children. I can beat myself up for the littlest thing, but they are quick to forgive, and I always want to be a person that holds short accounts. If (and when!) I do something that I feel sad about, I think it’s most important to model the behavior you are trying to teach–and for me, that’s getting down on their level, looking them in the eye and apologizing for exactly what it was that I may have done and asking for their forgiveness first. N: What’s your favorite thing about yourself? M: I don’t take no for an answer. I believe in unicorns (I mean, not REAL unicorns) 🙂 but I have an underlying belief that there is always a solution to the problem and there is always something even more amazing around the corner! I don’t see obstacles as a roadblock, but rather a hurdle to jump over . . . and I’ve learned that it’s okay to fall down if you don’t jump high enough the first time. Just get back up, dust off, hold your head a little higher and leap for the stars. N: As a mother of three, what’s a piece of advice that you wish you would have known and would like to share with expecting moms and/or brand new mothers? M: Enjoy each moment and know that right when you figure it out, things change–and that’s okay!! I think I thought that once I “figured out” the newborn thing, I would be good to go. Or once I “mastered” the whole toddler thing, I would be a parenting goddess. But the truth is, children are growing, organic, lovely little humans that are also just trying to figure it all out! We are all learning together and the joy is found in the journey. And that your child is absolutely unique, and you must be a student of them. Learn them. YOU will be the person that knows them the very best and advice that is great for someone else might not be perfect for you and your lifestyle or family. Pull bits and pieces of learned wisdom from everywhere and craft a beautiful masterpiece for yourself and your littles that makes sense for who they were created to be! N: How do you make time to spend with each of your children, individually? M: I take each of them on dates throughout the week. Depending on the time and craziness of our week, I might have more time and the dates are longer and more elaborate! Sometimes it’s taking my son, Jackson, for ice cream and simply laughing with him, giving him eye contact and holding hands with him–his favorite 🙂 Recently, I started “moon walks” with each of my girls–and after they get their pajamas on, we walk around the neighborhood right at dusk and play “I spy” and talk about our favorite moments from the day. The moments don’t have to be long (or have a financial component to them!) the main thing is eye contact and my undivided attention. N: What are your secrets to being a happy mommy and wife? M: I think for me, it’s so important to treat each of my children as the individuals that they are! They are each so beautiful and unique (as well as my husband!) and while one of them is extremely similar to me (Madelyn)–the other three people whom I love so deeply are so very different from me. 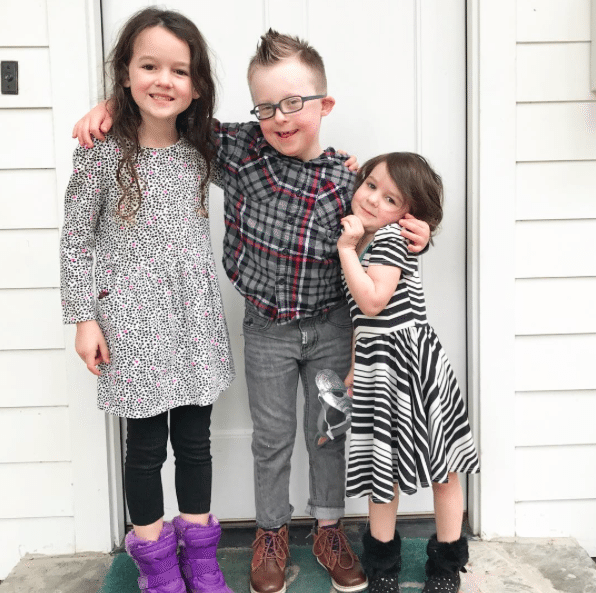 There is no piece of me that wants to change my husband or any of my children, and learning to love everything that makes them unique is part of what I hope makes them feel cherished, respected, and loved by me. I also think–especially when there were lots of toddlers at home–holding my home/schedule loosely was absolutely critical. There were seasons with giant ugly toys that made the worlds most awful music . . . and PTL those days are over! But when they were there, and so much of my day was spent cutting up tiny tiny pieces of food 3x a day and the constant mess of tiny toys everywhere–knowing it was just a season made me stop and just live in the moments! M: My greatest hope for my children and their friends is that they truly build relationships and understand the impact of having one another in their homes, having dinners together, traveling with other families and friends, and building face to face relationships in this digital world. I’m also hopeful that I can show and teach them some of the truths that I believe in, because in this new world of information overload, it can be so challenging to know what is true or right. They don’t have to believe everything I believe, but I want them to be able to ask hard questions and know how to search for the truth—instead of lean on others to tell their opinions on Facebook, or whatever platforms will exist in the years to come. M: That we love and respect each other–in all our differences. There are no two people cut from the same cloth, that have the exact same life experiences, have the same body, the same personality. We were all created so beautifully unique and have so much magic and beauty to bring to the world! The spectrums that exist can be so polarizing–from public school to home school, breastfeeding to bottle fed, working moms to stay at home mamas . . . the list is absolutely endless. My greatest hope is that we can see the incredible tapestry that’s woven together when we harness our strengths for good and use them to help out our friends, colleagues, and neighbors in a way that’s loving, collaborative, and respectful.